Gaskets have always been part of industrial production. However, gaskets have not always been forgiving, easy to use or simple to remove. What if the sealing products were designed to optimize the work put into them? What if the design had a level of intelligence built in? What if the design could make up for equipment damage? When used properly, enhanced surface profiles for gaskets can reduce leaks, spills and other releases that can damage the environment, put people at risk, result in fines and lead to costly downtime. Using surface profiling to reduce area and increase stress is found in everyday life, from the soles of running shoes to the treads on vehicle tires. Reducing the contact area while maintaining compressive force results in increased stress. In the case of gaskets, traction or friction between a gasket and the flange faces is critical to holding internal pressure. If the downward force created by the fasteners in a flange is diluted or spread over a larger area, the overall stress is reduced. Adding raised features to the surface of a gasket to reduce contact area and increase stress also tends to impact compressibility. Compressibility represents the ability of the gasket to conform to the surfaces it is being used to seal. 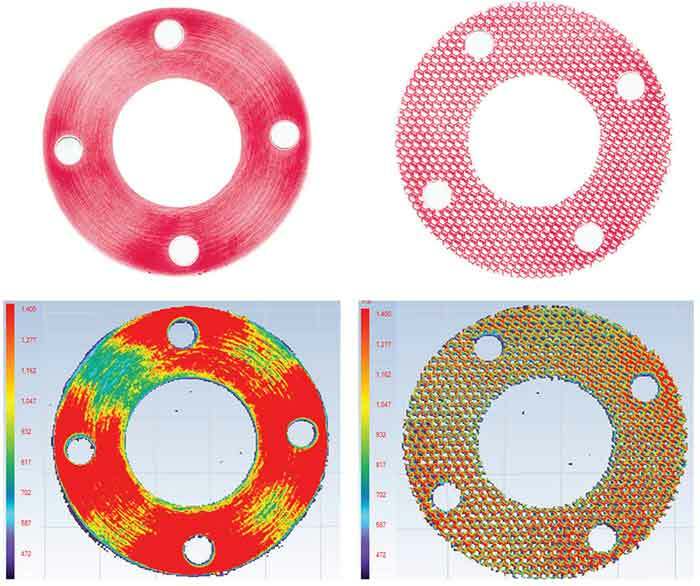 Flange surfaces usually show signs of wear, pitting, scratches or other defects. It is cost-prohibitive to make two mating flange faces smooth and flat enough to seal without a gasket. The more compressible a gasket is, the better chance the user has of attaining an effective seal. Compressibility also impacts the amount of pressure exposure on the gasket. When a flange assembly is pressurized, the internal media pushes outward on the inner diameter of the gasket. The thinner a gasket becomes, the less outward force it sees from internal pressure. This is referred to as improved “blowout resistance.” Unfortunately, one common error made when a gasket blows out is to replace it with a thicker gasket. This puts more gasket surface in the pipe or vessel for the internal pressure to act on. To create an effective seal, there are two functions the gasket must accomplish. First, it needs to conform to the flange face to prevent the media from passing between itself and the flange faces. This is where the compressibility is important. Second, the gasket must be able to resist or prevent permeation. On a microscopic level, most nonmetallic gasket materials have small voids or spaces. The key to preventing media from permeating voids or spaces is to close them off with compression. This can sometimes be difficult if a gasket is extremely hard, or the surface area of the flanges is relatively large. The use of surface profiling or raised features can be beneficial as the force is concentrated, generating higher densification and improved permeation resistance. Keep in mind that this concentration of the compressive force is being exerted at the point where the raised features are contacting the sealing surfaces or flanges. This results in higher stresses, higher friction and improved ability to hold back internal pressures. Load retention is how much of the work (torque, force, stress) put into the assembly is maintained over a given period of time. The opposite of this is creep relaxation. Since all performance features of a gasket relate back to stress, the more stress a gasket can retain, the better it will function. A gasket has to be compressible and able to seal with a given amount of applied force. All gaskets have some level of load loss over time, but that is largely due to the compressibility. For example, a solid piece of metal compressed between two flanges would likely have zero load loss, but it probably would not conform to the flange faces and initiate a seal either. The gasket must perform regardless of the sealing surface shape or size. Most solutions with profiled or raised surfaces are molded in shapes or sizes that require tooling or have limitations. Since there are countless configurations of sealing surfaces in pumps, valves, mixers, reactors, etc., the best solution can be made into various shapes. When the dimensional requirements are beyond the traditional dimensions of the product, options are often limited. Thus, a profiled material that can be fabricated in various configurations is ideal. Gaskets also must provide a reliable seal for large connections. A common method is to build the gasket in sections using dovetails or puzzle-like connections. When this is used, the compressibility takes on an additional role, deforming sufficiently in a radial direction to seal the dovetail back together under the compressive load. Gaskets need to conform to sealing surfaces, improve pressure resistance, resist permeation, optimize load retention and have dimensional flexibility to meet demands of sealing applications. A gasket should take a compressive force and create stress that results in a seal at lower loads. Engineered profiles or raised surfaces can improve performance. Matt Tones is a senior applications engineer at Garlock Sealing Technologies based in Palmyra, New York. He may be reached at matt.tones@garlock.com. For more information, visit www.garlock.com.